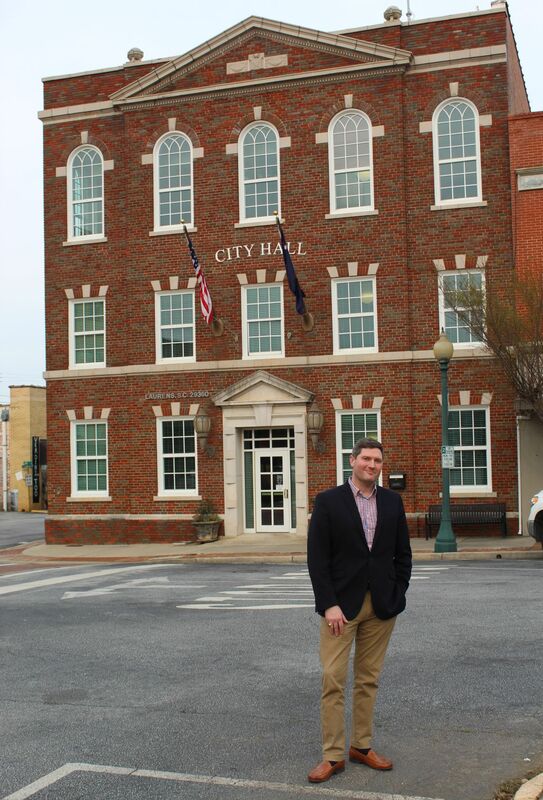 The Mayor-Elect of the City of Laurens is only 35 years old, but he goes way back. Nathan Senn spent six and a half years practicing law in Charleston. He and his family enjoyed it there, but he knew his name was never going to have the influence of a Ravenel, a Heyward, a Prioleau or a Rutledge. “I figured out that I wanted to go back to Laurens, where all I had to be was a Senn,” he said. The new mayor has only to walk down the sidewalk at the rear of the Historic Courthouse to get from one office to the other. He’ll walk it comfortably, waving at the cars, SUVs and pickup trucks circling the square. Unlike Thomas Wolfe, Senn could go home again. In the law office hangs a painting of Andrew Johnson, the 17th president, who lived in Laurens for a while and worked as a tailor. Senn is the artist. The painting epitomizes his Laurens roots. They don’t go back as far as Pres. Johnson, but they are deep. “My grandfather always called Laurens the garden spot of the world,” Senn said. The mayor Senn defeated, John Stankus, is a meat-and-potatoes guy who governed by making the best of what he had. Senn wants more than that. He wants to revitalize Laurens by being its promoter, its ambassador, its lobbyist. He wants to make the city greater than the sum of its parts. The election on March 5 was between two good men with different visions, and it was close. Senn received 447 votes, or 52.22 percent, to Stankus’s 408 (47.66). Next must the transition be made. “First thing is that I feel a certain sense of momentum, and I want to build on it,” Senn said. “We have some plans to have some investors come into town at the end of April, and before that, we want to make sure the city looks as good as it can. We’re going to push for a city-wide clean-up. … We are going to divide the city into sections and then have churches, community groups, everybody do as good a job as they can possibly do to clean it up, so that when we have company come to town, we want the house cleaned up when they get here. “That’s sort of the first thing out of the gate, and those investors will get a presentation about economic opportunity zones in Laurens. That’s a great asset we’ve been given by Congress, and it’s a real selling point that we need to be showing off. I intend to do all I can to bring outside money here. “Beyond that, my next focus is going to be on targeting housing, and by that, I mean, not necessarily single-family homes, but apartment housing because we’ve got to be able to provide a place for young college and high school graduates, who have decent jobs and want to come to Laurens, but may not have the ability to afford a mortgage at this point. Right now we have a lot of low-end and subsidized housing, but if you’re a recent college graduate, where do you live in Laurens? The swearing-in is next Tuesday. Senn is preparing. He wants to hit the ground running. “I had my first meeting with city department heads [Tuesday] morning,” he said, “and I sort of laid out what my expectations of them and their departments would be. At the top of that list was professionalism. I want people, in their dealings with city government, to walk away with the impression that, whatever it was, trash pickup to city police to paying their business license fees, whatever, to say, ‘Those folks really have it together. They know what they’re doing over there.’ Which is not to say that it’s not already happening, but we want to leave people with the impression that we are consummate professionals in every department. That’s what I would like. Senn is a man who has plans for big plans. The trick is making plans that work. “A leader has to have a plan,” he said. “The alternative to leadership is being led. Being a leader means making hard decisions. The new mayor has never held office before. Early experiences working in political campaigns discouraged him a while. Senn laughs easily. He enjoys a good one-liner and doesn’t mind poking fun at himself. He takes some amusement in where he is and where life has taken him.